I grinned and dug into my plate of unhealthy-as-hell but most delicious nachos that had been placed before me. We were at our favorite local dining establishment, our version of Luke’s place. 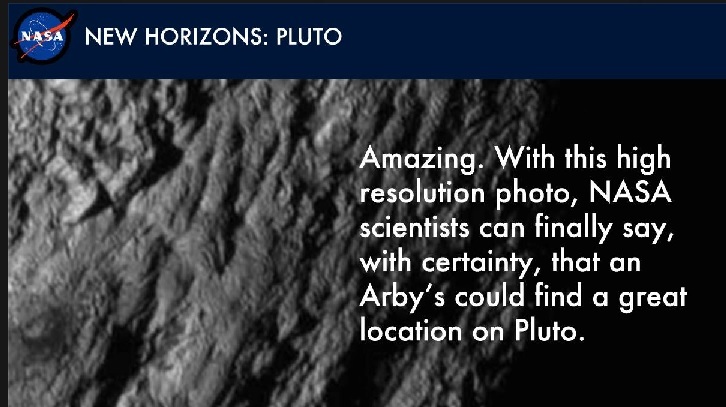 And I knew immediately that the Corbster was referring to the “fake science” photo he had posted to my wall, which combined my obsession this past week around the Pluto New Horizons mission and Corb’s perpetual obsession with everything Arby’s. “Sign me up!” Ah, Corb is so lovely when he gets on these tangents. “That would be awesome!” And with that, he swooped in to steal one of my nachos. Hmmm. They might be a little cold by the time he returned. “Maybe if you brought back a beef and cheddar roast beef sandwich,” I replied. Categories: Uncategorized | Tags: arby's, corb, pluto | Permalink.